When you dress a Barbie doll, you want her to look her best. Remember, she can be anything you want her to be--in five minutes you can turn that McDonald's Cashier Barbie into a certified M.D.! Read on to learn how to style your Barbie to her maximum potential. Get out your favorite Barbie doll, along with your collection of Barbie clothing. Remember, the clothes that initially came with the doll will probably fit her best, but Barbie clothing in general is pretty versatile. If you're a big Barbie fan, you've probably accumulated enough pieces to have no trouble picking out a fashionable outfit. Select a few basic items from which you can determine a new outfit for your Barbie. 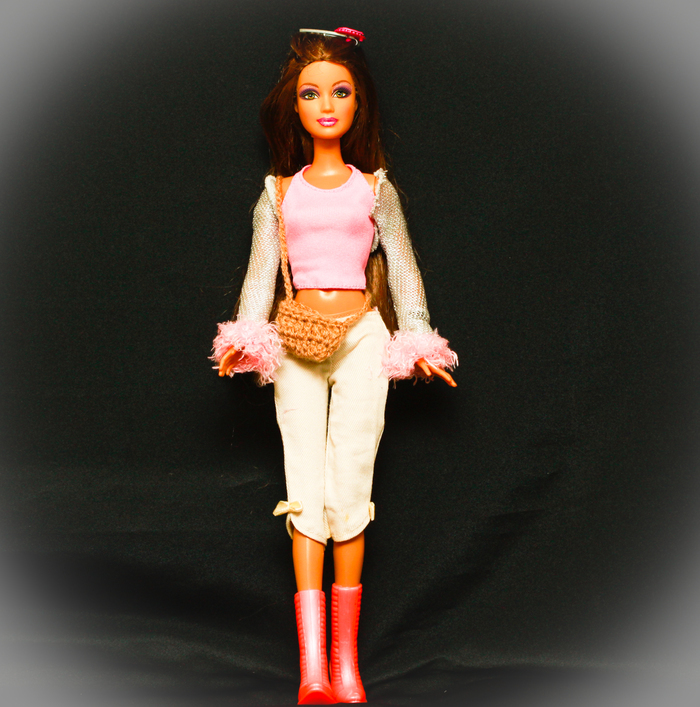 For example, a shirt and a skirt, or a sweater and a pair of jeans if you're dressing Barbie for cold weather. You'll find that some clothes will fit better on certain dolls, since bust, chest, and hip size can vary depending on when the doll was made. Additionally, you should factor in the different types of doll clothing brands when picking out your Barbie's outfit. If you're going for a really good fit, don't use anything from a Bratz or MyScene wardrobe! Look through your Barbie's shoes for at least a couple of minutes before carefully choosing the most suitable pair. Are you trying to dress Olympic Barbie? Dig up some tennis shoes. Hipster Barbie? A miniature pair of Oxfords should do the trick. What about CEO Barbie? You can do no wrong with a pair of classic black heels. Remember, Barbie's shoes are one of her claims to fame, so your process of selection must be airtight! Next figure out accessories for your Barbie. Again, match them to whatever identity you've chosen for her today. Doctor Barbie might have a stethoscope hanging around her neck; Editor Barbie might have a pair of reading glasses. Don't be afraid to mix and match! Your Barbie can have as many interests and occupations as you want, and her outfit should reflect that. By now you should have your Barbie's full ensemble laid out next to her. Moment of truth: time to put it on. Most Barbie doll clothes have Velcro or clasps on the back, so simply unfasten that part and pull her arms and legs through. Dresses will be easier for Barbie to wear, but if you're looking for a challenge, go ahead and try out a three- or four-piece outfit. Once you've gotten her dressed, flip her over and press the Velcro or clasp back together. Some sleeves may have very small cuffs. In order to get the hands through the cuff, you may need to squeeze the doll's hands while inserting them. Gently twisting the sleeve left and right during the process may help. Add shoes and accessories last. These should be simple enough to get on your Barbie, although they tend to fall off more easily than primary articles of clothing. If you want to preserve this perfect look of yours, snap a photo or two. If not, go ahead and send Barbie on her next adventure! You can also make your own clothes. Patterns and kits are available online and in books. Check out your local craft store for ideas! Remember to take good care of your Barbie clothes if you want them to keep looking nice--store them in a cool, dry area, and wash them if they get dirty. You can get Barbie clothes at any small toy store or larger stores like Target with toy aisles. Follow the same rules for coordinating and accessorizing that you'd use to select an outfit for yourself. Do not force too-tight clothes onto Barbie dolls! This can damage the clothes or doll. The majority of Barbie products are made in foreign countries, so just keep in mind that the quality of your doll may vary depending on that country's production standards.